Enjoy views of Mount Desert Island from the oceanfront cottage. 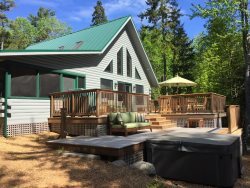 Island Sky is a cute, comfortable cottage just over the bridge in Trenton, with beautiful views of MDI and the Mount Desert Narrows. The open floor plan includes kitchen, dining, and living room on the first floor and open king bedroom upstairs. The bathroom with shower is off the kitchen area. Island Sky has a gas grill out on the deck. Easy steps right down to the ocean's edge. The Downeast Lobster Pound is just at the end of the road and the Trenton IGA Market is minutes away.